A thoroughly researched account of how Americans fell in and out of love with French cuisine and cooking. Cultural historian Spring (Secret Historian: The Life and Times of Samuel Steward, Professor, Tattoo Artist, and Sexual Renegade, 2011, etc.) 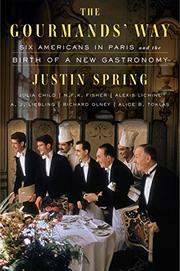 returns with a stunning account of six eclectic, electric personalities, a group of Americans who helped popularize French cooking in America in the middle of the 20th century. Some are names that even the most casual cook knows (Julia Child, Alice B. Toklas), but others will be recognizable mostly to oenophiles or those who know a bit of kitchen custom and/or history (M.F.K. Fisher, Alexis Lichine, A.J. Liebling, Richard Olney). Throughout, the author combines biography and cultural history. He tells us the relevant pieces of his principals’ biographies—focusing, of course, on their gastronomical work—and how each affected the swelling interest in all things French. He also credits numerous others, including John F. and Jackie Kennedy, for influencing public opinion. Although Spring is mostly generous in his assessments, he does do some occasional slicing, especially on Fisher, whom he basically calls a liar—though he recognizes that her artful lying was a form of storytelling. It is fascinating to read how these six figures discovered French food, wine, and cooking and how each developed a specialty and then brought that knowledge to a public eager to read about it all—or, in the case of Child, who had a long-running show on PBS, to see it on TV. Spring also discusses the deaths of each of his subjects, their legacies, and the ultimate implosion of the fascination with French culture, brought on largely by the turmoil of the late 1960s, both in the U.S. and France. A literary meal both luscious and lively—and essential to understanding our vacillating love affair with the French.